Yesterday’s birthday celebrations continued well into the small hours without us. We had all been asked to arrive early at the venue to preserve the element of surprise. The hall had been beautifully decorated with cycling artifacts and mementoes. All of us from the cycling club were seated together on the Criterium International table. When the star guest turned up it was evident that he’d had no idea and was genuinely delighted to see so many friends and family gathered in his honour. It goes without saying that the food was spectacular, despite it being catering on a grand scale. As the afternoon wore on, many of the guests danced off the feast. The cycling quiz was a bit of a damp squib as my team mates clearly don’t share my obsession with the sport. Only ex M Le President made a stab at it and, frankly, did rather well without resorting to checking up on the internet via his mobile. If I say so myself, the birthday cake looked rather splendid and was reduced to a few crumbs within moments of it being cut. Fortunately, the birthday boy managed to snag a piece. One of my clubmates is a professional chef and he was highly complimentary which was very satisfying. It looks somewhat dwarfed in the photo by the other creations but they were intended to feed the 60 odd guests. My beloved called my creation “Chocolate Fort Cake”. I think there’s an intended pun in there. We were reduced to watching the dying kilometers of what had evidently been an exciting Milan-San Remo on my beloved’s mobile phone. On a screen that size it’s difficult to work out who’s who, but it was easy to see that a number of the favoured riders were in contention until Matt Goss pipped them on the line. The result was confirmed by my friends watching the race live. We left the party early anticipating arriving home in time to watch the race highlights on Eurosport only to discover a scheduling change meant it wouldn’t be on again until 1 o’clock in the morning. Far too late for someone with a 6 o’clock start the following day. Luckily the armchair sports fan had summarised the race. I read his as-ever excellent report, made my savoury cakes and pissaladiere for the following day’s “Gentleman”, took the cakes out of the freezer to defrost and was fast asleep in bed by 21:30. Today, I rose as programmed at 06:00, washed, dressed and packed everything into the car before heading down to the finish line to set out my wares to feed the ravening hordes of the “Gentleman”, a two-person time-trial where the combined ages of the two must exceed 60. The weather was fortunately kind to us and before long the sun was shining. Proceedings started at 08:30, made more difficult by heavier than anticipated traffic round the industrial estate. I haven’t checked but I’m pretty sure numbers were up on last year’s edition. 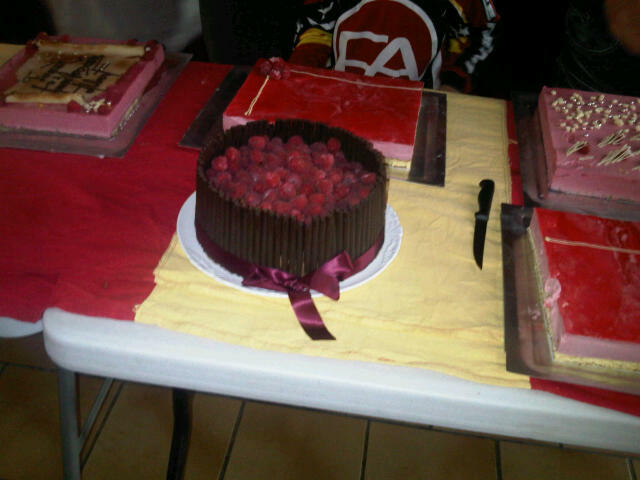 The homemade cakes were well received with some riders finding it necessary to sample at least one of each. Disappointingly, I only received one enquiry as to my marital status but plenty of compliments, including one from Jeannie Longo who ate a piece of my fruit cake. I have managed to keep back a few pieces of it for my sister Lynn who is something of a fruit cake connoisseur but everything else disappeared pronto. After two (long) weeks at home, my beloved departs early tomorrow morning for a week long business trip leaving me to savour the peace and quiet. I plan on spending plenty of time out on two wheels enjoying the fine Spring weather. My cycling coach has a test ride up Col de Vence on Thursday for which I feel ill-prepared after my heavy cold. Hopefully, a few gentle but long rides will help me refind my form. Assuredly, I will post the slowest ascension of the group but, hopefully, be faster than at a similar time last year.